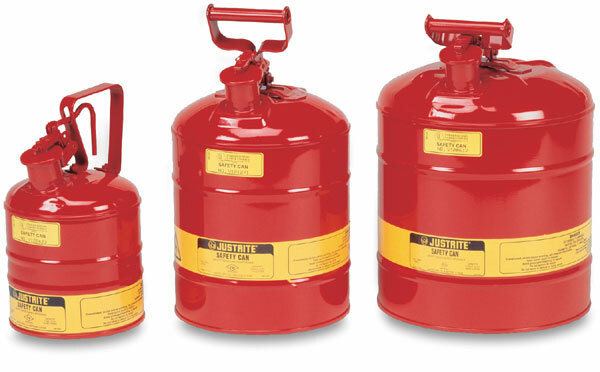 Practical, safe, and easy to use, Justrite Type I Safety Cans are just right for storing and carrying flammable liquids. Terne plate safety cans have a single-spring loaded spout to facilitate pouring into other containers having wide openings. The quart and gallon models have a fixed handle with a trigger release cap for one-handed filling and pouring. The 5 gallon model has a swinging handle for easy handling of full cans. All sizes include a spring-loaded pressure relief vent, plus a free-flow, double-mesh flame arrester to prevent ignition sources from entering without restricting liquid flow in or out. The quart model measures 8-1/4" H × 4-5/8" diameter, the gallon model measures 11-1/2" H × 7-1/4" diameter, and the 5 gallon model measures 17" H × 11-1/2" diameter. ® Justrite is a registered trademark.